The playoff picture for the senior football championship will be finalized on Sunday at the ICC with the last round of games. The teams with the biggest interest will be Galway, Donegal, and the Shannon Blues. Galway and Donegal clash in a top of the table matchup at 2:00. Donegal have a 100% record in the championship, while Galway are on a 5 game winning streak. A win for Galway will see them into the semi-finals automatically, while the Blues will be hoping for a Donegal victory as they might have a shot at second place should they defeat the Tones in the last game of the day. Shannon Blues still have a shot at a bye into the semi-finals. The Connemara Gaels take on Christopher’s, who are already out of contention, and it will be a quarter final game for them regardless of the outcome. Along with the Tones and Aidan McAnespies it will be a case of waiting to see who they will play a week from now in the quarter finals. Junior A Football sees a big game for the Connemara Gaels when they meet Aidan McAnespies. The Gaels and the Blues tied two weeks ago and are also tied in the standings for a semi-final place. The Blues, however, have 2 more games left on their schedule and could overtake the Gaels regardless. There are playoff places at stake in the junior B football championship also. Donegal play Hartford Saturday, and are tied on points for the last semi-final spot with the Connemara Gaels. The Gaels meet Kerry on Sunday where a win will keep them in contention of continuing their season. Galway, Cork and Kerry are already in the mix. Junior A Hurling sees what looks to be the 4 semi-finalists in action at the weekend when Wexford take in high flying Tipp on Sunday, while Tom’s and Offaly meet Sunday. Farther afield in Portland Maine, the Barley House Wolves travel and hope to secure top spot in the junior C division. 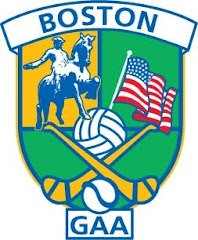 Also this weekend underage players from the Boston Northeast division are in Buffalo, New York, at the Continental Youth Championships. The venue is impressive, the West Seneca Soccer Complex. The location has been converted into more than a dozen GAA fields to cater to a packed schedule of games for teams from U8 to minor. More than 20 teams from St. Brendan’s, Irish Sports Youth League, and Trinity Milton have been in action the past 2 days, with many hoping to challenge for honors on Sunday. Irish Cultural Center, Canton Ma.